A military band that surprised us in the Marais. We don’t know the occasion. Could it be they were recognizing the American Independence Day? Who knows. Maybe they do this every Tuesday. 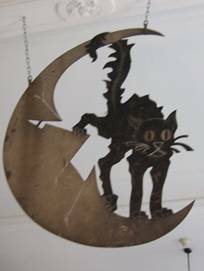 An old tavern sign in the Musée Carnavalet. Inside Notre Dame des Blancs Manteaux in the Marais. This church reminded us very much of Saint Sulpice, which we also visited later in the day. The official sales started at the beginning of this month. I like the fact that this clothing store kept the old art nouveau bakery façade. 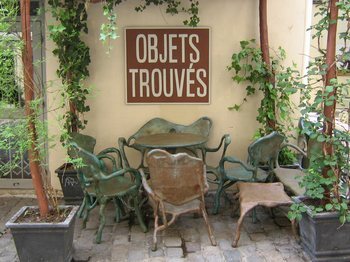 Cool outdoor furniture in front of a shop in the chic Village St. Paul, in the 4th arrondissement. Lights in the Napoleon Courtyard at the Louvre are all in disrepair. You’d think that the Electric Company leaders would want to see them fixed, since there is a plaque giving them credit for installing the lights. Yesterday was eventful because we went to see two apartments, one in the Marais and one in the 6th arrondissement, near St. Sulpice, where we thought we might stay for the month of September. We decided on the one near St. Sulpice, in large part because we like the owners so much. They both have design and academic backgrounds, and lived for some years in New York state where they still live in the summer. It is great to make new friends in Paris. In between these appointments, we wandered around in the 4th, 1st, and 6th arrondissements, taking in the Musée Carnavalet once again. 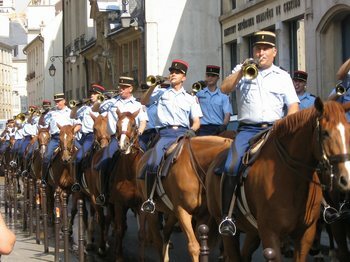 While wandering in the 4th, which is the Marais (former swamp), we were surprised by a military band on horseback. We also visited the serene Notre Dame des Blancs Manteaux, a church near the National Archives. Lunch was at the Café Hugo on the northeast corner of the Place des Vosges. We highly recommend this place. You can sit outdoors, always in the shade, and have fabulously fresh salads with perfect vinaigrette and cheerful service. Prices are very reasonable. After lunch, we wandered down to the Seine and it started to rain, thank heavens. We stood in an archway at the rue de l’Hirondelle (the Street of the Swallow), one of those impossibly tiny and short streets not far from the Sorbonne. When the rain lessened, we went on to St. Sulpice, Hemingway’s favorite church in Paris. Inside it was mercifully cool (outside, it was 90 degrees F). The famous organ was being tuned. I found that to be interesting, and Tom found it annoying. But we were both footsore and had about 20 minutes until our appointment nearby, so we stayed. I eventually walked around inside the sanctuary and came upon the sacristry, which was open (never has been before when we visited). Inside, a gracious gentleman explained to me and to a young Brazilian couple all the symbology used in the carvings on the sacristry walls. The room has been beautifully restored with money donated by Americans. Interior Minister Nicolas Sarkozy had announced a plan to deport illegal immigrant youth as a way of retaliating for all the riots they committed last Fall. He has been very vague about what criteria will be used to determine exactly which kids will be deported. His plan has drawn great criticism as well as large demonstrations. On Saturday (the day of our arrival when we slept off our jet lag), there was a demonstration from the place de la Bastille to Bercy, on central Paris’ east side. According to the police, there were 7,200 demonstrators. The organizers of the event claimed there were 50,000, and Le Parisien claimed there were 15,000. Mostly immigrants demonstrated, but there were also non-immigrant parents who don’t want their children’s classmates to be deported. Le Parisen also reports that the French morale has improved. It has gone up from 28 points to 30 points (out of how many, I wonder? A hundred?). This is because households have the feeling that life in France is improving. They also think that their buying power will improve, and most think their own financial situation is evolving positively. The job outlook has improved slightly as well. Air pollution was a real problem on Monday and Tuesday, but today is much better, according to Air Parif and my nose. The mayor of Paris encouraged Parisians to leave their cars behind and to take public transport instead. That’s what we do. For three months of the year, when we are here, we do not drive a car at all. Now if everyone could do that, think how different the world would be today. Let’s get back to Saturday. So many things happened in Paris while we slept off our jet lag. There was live jazz at the flea markets of Saint Ouen. There was a Tropical Carnival at Republique in the 10th arrondissement, where 30,000 people participated in a parade (bigger than the demonstrations mentioned above?). Most of the Tropical Carnival participants have their roots in the Caribbean. Another Saturday festival celebrated a chevalier from Barre who was executed for blasphemy 240 years ago. The young man’s crime was not removing his hat when a religious procession passed by. His punishment was that his tongue was cut out, he was decapitated, and then his body was burned. The remembrance takes place every year, I think, at the foot of Sacre Coeur. A new swimming pool on the Seine will open on Thursday. It is called the Piscine Josephine Baker, and it is located on a barge by the Porte de la Gare and quai Francois-Mauriac in the 13th arrondissement, near the Mitterand Library. Open from 10AM to 10PM Monday through Friday, and from 10AM to 8PM on weekends, the pool is sure to be popular. The fee is 5 euros for the first two hours. (To discourage lounging, after the first two hours, you are charged an additional 5 euros per hour.) A full-length (25-meter) lap pool, it only has four lanes marked and is just 10 meters wide. Certainly this will be crowded. Supposedly, 508 people will be allowed in at once. That’s a bit much!!! The pool has a glass roof above and glass walls all around. It is going to be featured as one of the stars of the fifth edition of Paris Plage (the Paris beach project that will open soon). The mayor has also announced that he wants to build another, similar pool on the west end of Paris, near our dear park, Andre Citroen, in our 15th arrondissement. Yesterday, the mayor of Washington DC was in Paris to visit the mayor of Paris, whose name is Bertrand Delanoe, by the way. There were two purposes to this visit. One was the unveiling of a portrait of Rosa Parks at the entrance of a sports complex named after her in the 14th arrondissement. An hour later, a statue of Thomas Jefferson was inaugurated on the quai Anatole-France, at the Solferino pedestrian bridge in the 7th arrondissement. The sculptor’s name is Jean Cardot. 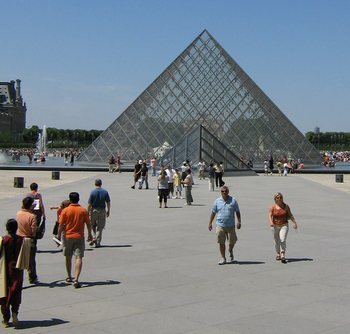 Just as all major cities have different systems for classifying their levels of terrorism alert, Paris has a system of classifying their level of alert in the event of a heat wave. As temperatures have been quite hot, Paris entered Level 3, which means “maximal mobilization.” At this level, city hall reinforces the information on the electronic information boards that one sees near many métro stations. The city also augments the number of personnel working in the retirement homes and sets up a phone number, 39.75, that fragile people can call for help. The newspaper says that an office of tourism information desk was inaugurated on Monday at terminal 2F of the Charles de Gaulle airport. I happen to know it was really open on the Saturday before that, because I used it. In a confused, jet-lagged state, I asked, ungrammatically, in French, “Please, m’am, where is the taxis?” The nice lady at the desk answered my question in English without correcting my French. The real answer is, you have to walk up to terminal 3 to the taxi stand there because terminal 2 is terminally unfinished.